This weekend marked a couple big milestones for Pixar’s Toy Story 3. The first milestone they crossed was the $400-million mark domestically, to become only the second Disney film to ever cross that mark at the box office. (The other film to do so was Pirates of the Caribbean: Dead Man’s Chest.) The next mark they crossed was $940-million worldwide surpassing Shrek 2 as the biggest animated film of all time. Now granted, there is a couple asterisks in all of this. 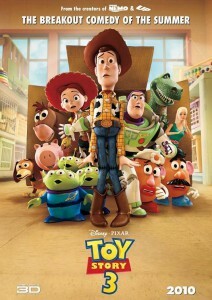 The biggest of which is the boost added by the prices of 3D, of which much of Toy Story 3‘s tickets sold were. The other “if” is the adjusted ticket price. Despite having the highest gross the film does not boast the most amount of ticket sales. In fact currently, Shrek 2 still leads the Pixar film in that regard. That isn’t to say that none of this is impressive. The film has a very real chance of being one of the few films to cross the $1 billion mark at the box office. It’s always great to see quality films do well at the box office.